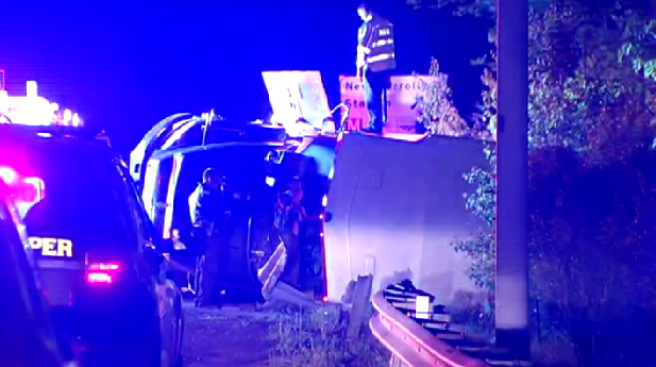 Armored Truck Overturns Along Route 50 in Md. Drivers traveling along Route 50 in Prince George's County may experience some delays Thursday morning after an armored truck flipped onto its side. The accident happened just before 5 a.m. near the ramp for Route 410. Maryland State police say a car traveling in front of the armored truck stopped suddenly, startling the driver of the armored truck. The armored truck crashed into a guardrail, coming to a rest on its side. Crews pumped gas from the truck before towing it away from the scene.